Paige Hill: Build a Snowman! No, there's no snow here yet, but that doesn't mean I'm not building snowmen! I'm putting together a bunch of stuffed snowmen for Christmas gifts this year. Not getting very far, but maybe this weekend I'll get one posted. Until then, I thought I would share Snowman In A Can! Wouldn't these make great neighbor gifts? To save time (what? save time? ), you could just purchase a scarf and mittens. 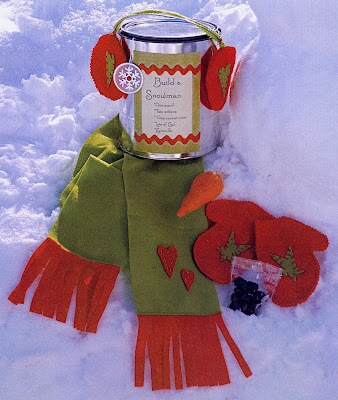 You could also use a different container, I just thought the idea of a Snowman in a Can was cute:). Cut a strip of the green felt 5x46”. Cut another small strip of the green 2x11 inches. Cut two red squares 5”x5”. These are for the scarf. Double the red felt and cut two mittens (you will have four mittens). Do the same with the earmuffs. Out of the orange felt, cut the nose. Cut two primitive hearts out of the green felt, and two out of the red. Next, cut two green stars. Hand stitch a star to the right side of both mittens. Make sure you sew on the correct side (thumbs up). Do the same with the earmuffs. Sew one of the red squares to the bottom of the scarf-Right sides together. Do the same with the opposite side. Cut fringe in the red square. Next, hand stitch the two red hearts on the topside of the scarf. Sew the mittens-wrong sides together, All along the outside seam. Cut the seam allowance down with the pinking shears. Do the same with the earmuffs. Next, sew the nose right sides together on the long end. Turn right sides out. Sew a running stitch with the orange floss along the top of the nose. Next, stuff with excelsior, glue the stick in place, and pull the threads tight. Cut a piece of wire about 11 inches long. Using a zig-zag stitch, sew the wire to the small strip of green felt. Cut close to the wire using the pinking shears. Glue to the earmuffs. Using the clay, sculpt the “Coal”. Follow the directions on the package to cook the “coal”. Sew a small bag out of two small pieces of the page protector. Place the coal inside, sew shut. Place the excelsior, mittens, scarf, nose, and bag of coal inside the can. Attach the earmuffs to the top of the can with two pieces of wire on either side. Using the patterned paper, solid cardstock and ric-rac, make a label. I laminated mine using a home laminator (xyron). Place on the front of the can. Place the snowflake charm on the vellum tag and attach with the colored brad. Oh, so cute and wonderful!!!!! Thank you!!!! That is so cute! I know lots of families that would love that. Thanks! love your blog, this snowman is such a great idea. thanks for coming to my bog, saying hello and entering the giveaway. good luck and thanks for becoming a follower. Totally cute Paige. Did you see you won something over on Sandi Henderson's giveaway?! Lucky girl!